In a drive to preserve the environment in a sustainable way, jute bags are 100% biodegradable and cost effective substitute for plastic bags. Grocery Jute bags can carry more weight and recycled very easily as compared to conventional carry bags. Big enough to carry various contents, these eco friendly grocery bags are good option from utility point of view. These highly durable and cost effective jute bags are ideal for carrying vegetables to heavy items and suitable for picnics also. Grocery Jute Bags are highly versatile as they can carry lots of items, making them perfect for shopping. They have become the basic necessity as almost everything available at a grocery store can be easily carried in these bags. Reusable Grocery Jute Bags are available in various sizes and vivid colors for endless reasons and styles. Their soft handles are easy on hands and provide smooth grip. In the recent past, use of eco friendly jute bags for groceries has become an effective measure to preserve the environment. With the Indian government banning the use of plastic bags, grocery store / supermarkets are now providing Jute Bags for carrying the purchased items. They provide Grocery Jute Bags that are mostly simple in design and easy to carry. Else, one can acquire his / her own Grocery Jute Bags from market as per individual choices of colors, styles, sizes and designs. In fact, these bags can be custom developed depending on the store requirements. Customizing of such bags is highly beneficial for the superstores as the tailored grocery Jute Bags act like their promotion media. Hence, a brand can be promoted for a very long time that in far much lesser cost. 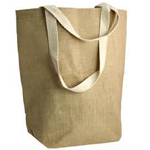 The size of jute grocery shopping bags is generally on the medium-to-large side, with its straps being carefully designed to lay least possible amount of effort on the hands or shoulders, when carrying them.